Ever been to Lagoa, Rio de Janeiro? I haven't but, it sure looks beautiful. The founder of Lagoa Swimwear got her idea to create these unique swimsuits while spending time in the lagoons of Lagoa in Brazil. These beautiful bikinis were designed to make beach days better. You can look and feel beautiful at the beach in your Lagoa swimsuit with three "must-haves" packed into one swimsuit. First and foremost, Lagoa swimwear comes with a zippered-pocket! A pocket you say? I have never seen or heard of a bikini with a pocket in it. It is located under the arm and you can't even tell it's there. Your beach days just got better because you can put your money, ID, jewelry and chapstick in there. What a clever way to keep your valuables safe when you're in the water. 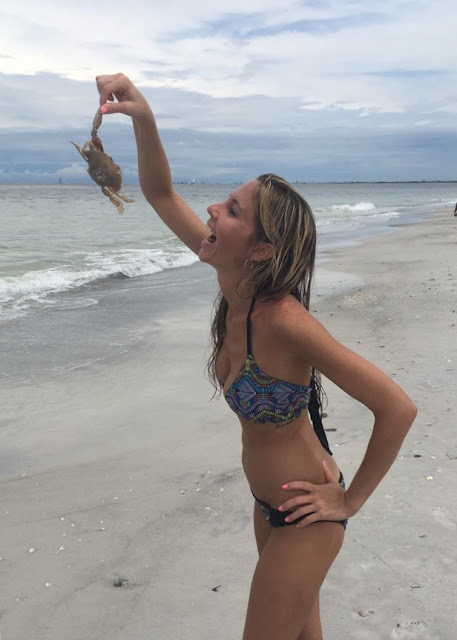 I chose to explore Egmont Key and snorkel in the Gulf of Mexico in my Lagoa Bikini with treasures stashed in my bikini top's pocket. Secondly, we won't have beautiful beaches and clear water to swim in unless we all work together to protect the environment. Lagoa donates 10% of profits to ocean conservation and the Surfrider Foundation. I was also so happy to receive my bikini in eco-friendly packaging. It is recyclable, recycled, biodegradable, reusable and renewable. Every little bit helps and you can fully enjoy your beach days for longer. The third must-have makes your beach days beautiful in multiple ways. Lagoa tops and bottoms are all reversible! The "Mary" bralette and "Sarah" ruched bottoms that I'm wearing in the photos above reverse to black. I'm sure I'll be wearing this one quite often.